Anula Perera has an amazing story of a journey that has been filled with rich life experiences. A resident at DCT for three years, she is finishing out her 7th decade with an unwavering commitment to discovering new things and savoring the spice that is always to be found in another day of life. Born and raised in Sri Lanka, she and her husband made a decision to look for a better environment to raise their family during a volatile period in the country's history. Her husband, an internal medicine doctor, was offered an opportunity to practice medicine with the government of Trinidad and Tobago. After living, working and raising family for 22 years on the island of Trinidad, they immigrated to the United States to pursue high school and college educational opportunities for their two daughters. 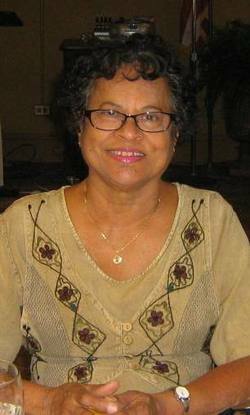 A long time resident of Staten Island, New York, Anula worked as a dental hygienist in the city of New York for many years. After her husband passed and she was diagnosed with cancer, she made a transition to be close to family. Here in Atlanta, Anula finds that the community of DCT to be just right for her with enough urban amenities, transportation and neighbors to give continuation to her long journey of sharing life with all colors and nationalities.